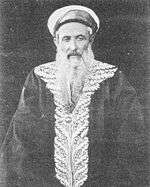 Eliyahu Moshe Panigel (1850–1919) was the sephardi chief rabbi of the Ottoman Empire, Palestine and Jerusalem. Orphaned in at a young age, Panigel was brought up by his uncle Raphael Meir Panigel, the rishon le-Zion (sephardi chief rabbi of Palestine). He was sent to Algeria to collect funds for the Misgav Ladach Hospital in Jerusalem and to North Africa, Italy, India, the Caucasus and Bokhara, by the Jerusalem community. After the death of Jacob Saul Elyashar in 1906, a dispute arouse within the community as to whom should be appointed his successor. The more modern members supported Jacob Meir while the more traditional supported Chaim Moses Elyashar. Meir assumed the position for a few months before he was deposed by the Sultan of Turkey. In 1907 Panigel was chosen as hacham bashi and rishon le-Zion but he was forced to resign 1908. Rabbi Nachman Batito subsequently served as deputy chief rabbi from 1909 to 1911 whereupon Rabbi Moses Franco of Rhodes was appointed chief rabbi until 1915. When Jerusalem was captured by the British in 1917, Panigel publicly welcomed General Allenby and the Jewish Legion. 1 2 Fred Skolnik; Michael Berenbaum (2007). Encyclopaedia Judaica. Macmillan Reference USA in association with the Keter Pub. House. p. 612. ISBN 978-0-02-865943-5. Retrieved 11 May 2011. 1 2 Joseph B. Glass; Ruth Kark (31 August 2007). Sephardi entrepreneurs in Jerusalem: the Valero family 1800-1948. Gefen Publishing House Ltd. pp. 250–251. ISBN 978-965-229-396-1. Retrieved 11 May 2011. This article is issued from Wikipedia - version of the 7/19/2016. The text is available under the Creative Commons Attribution/Share Alike but additional terms may apply for the media files.